Amid Keystone XL Fight, The Lakota Treaty Of Fort Laramie Turns 150 Native Americans of the Northern Plains are gathering this weekend to commemorate an 1868 agreement with the United States — one often invoked in the debate on pipeline construction. 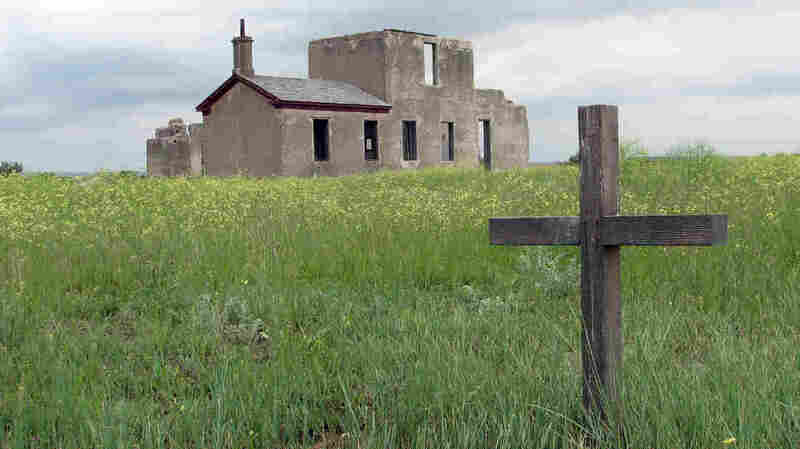 A wooden cross marks an unidentified U.S. Army grave at Fort Laramie, Wyo., as pictured in 2009. The Fort Laramie National Historic Site will host a gathering of Lakota people this weekend to commemorate an 1868 treaty with the U.S. government. Native Americans from across the Northern Plains are gathering at Fort Laramie, Wyo., this weekend to mark the 150th anniversary of a treaty between the Lakota people and the United States. It's a document that some feel has been overlooked. Phil Two Eagle is one of those organizing this weekend's gathering. He says treaty violations began "before the ink dried," starting with the 1874 discovery of Black Hills gold. Two Eagle believes Washington has ignored its own agreement, and continues to do so with the planned construction of the Keystone XL pipeline. "President Trump signed a permit that will allow Keystone XL to come through," Two Eagle says. "And that Keystone XL is coming right near here, on the Rosebud [Reservation]." But the Lakota have not forgotten. "This treaty is binding," Two Eagle says. "It's a working document for us." The Native American Rights Fund is invoking the treaty to fight the pipeline on the Rosebud Reservation. And though President Trump approved the project's permit, no action has been taken due to pipeline issues with the state of Nebraska. In Rapid City, S.D., Carla Rae Marshall hopes the treaty will stop a Canadian mining company's current gold exploration in the Black Hills. "Now they are saying that with this gold exploration, they're saying, 'Well, we don't need to consult with tribes on that because it's private lands,'" she says. "Those private lands — they were taken after our treaties." Lakota tribal members are suing to stop that gold exploration as they await the U.S. Forest Service's decision on a request to drill public (i.e., original treaty) lands. On the windswept Wyoming plains, Fort Laramie National Historic Site Superintendent Tom Baker prepares for the anniversary. He points out that the document signed here in 1868 is still valid. "It's equivalent to our Constitution of the United States," Baker says. "That's how important it is. It's international law. It's a treaty." As Lakota tribal members gather at Fort Laramie this weekend, they'll have prayers, traditional songs and plenty of food. There will be stories about the past — and a renewed effort by the Lakota to ensure that the 1868 Fort Laramie Treaty is upheld.